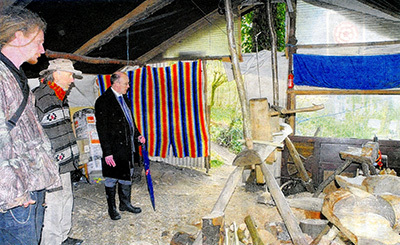 I am aware that in June 2015 DNPA refused planning permission for a new wood drying barn and a store for tools and machinery at Hillyfield Plantation, and in January 2016 served enforcement notices on several structures, and that a planning inquiry is scheduled for March 2017 to consider the owners’ three appeals (3140928, 3146596, 3146597) against these actions. Having had an opportunity to visit the site and to discuss its management with the owners and others, I am persuaded that Hillyfield is a fine example of how woodland on the fringes of Dartmoor can be sustainably managed, with community benefit, in the 21st century. Rather than causing any harm to Dartmoor, visually or otherwise, it is a significant asset of which the National Park should be proud. Therefore I am now writing on behalf of the Dartmoor Society to respectfully ask Dartmoor National Park Authority to rescind its refusal of planning permission and its enforcement notices, and to withdraw from the planning inquiry. These would be noble and wise gestures, which would be widely welcomed. Such action would also enhance the reputation of the Park Authority and would save the expenditure of considerable sums of public money and other resources. I understand that there has recently been some public consultation about the creation of a proposed whisky distillery in Princetown. I was not able to attend this, but understand that the proposed distillery would require the demolition of the Electricity Generating Station at SX 58877348, immediately adjoining the west side of the carpark. This building has recently been used as the Princetown Smithy/Forge. I would like to draw your attention to the fact that the Electricity Generating Station is an important part of Princetown’s historic fabric, and that everything should be done to prevent its loss. Not only was it the first provider of electricity for Princetown, but was designed in 1923 by Richardson & Gill, the Duchy architects who were nationally among the best-known architectural firms of the inter-war period. On its north side, there is a fascinating coloured plaque specially designed in London for the building. A good summary history of the building, based mainly on Duchy records, by Ted Luscombe, was published by the South Western Electricity Historical Society in 2002, titled ‘Princetown Electricity Supply’ (Supplement 1 to Histelec News No.21). Princetown has lost many important historic buildings (the Railway Station, the Town Hall which was also designed by Richardson & Gill, the Imperial Hotel, Bolt’s Stores, Morwenna House and others) and it would be tragic if this building was also demolished. For a discussion of these losses and of the importance of Princetown’s built fabric see my Presidential Address: ‘Dartmoor & the Displacement of Culture: Analysis & Remedy’ in Transactions of the Devonshire Association, 147 (2015), pp20-24. So far as I am aware the building is not listed and falls just outside the Conservation Area, but this reflects lack of information and understanding at the time of designations, and should not diminish a sense of its importance. I have also written to Tom Stratton of the Duchy of Cornwall. The Dartmoor Society would be most grateful if you could use your good offices 1) to draw the attention of your Historic Buildings Officer to the importance of the building 2) to advise the promoters of the distillery to amend their plans in order to preserve the building, and 3) to take steps to ensure the long-term safeguarding of the building by finding an appropriate use for it. Society progresses through innovation – in science, in arts, in rights for humans and creatures, and in how to care for the environment. But not it seems on Dartmoor: Last week a planning inspector made a decision which could lead to the eviction of 12 adults and nine children from their low-impact homes in Steward Community Woodland. This was established sixteen years ago, near Moretonhampstead. The community, having twice been given temporary permission to continue living in the woodland, after appeals, applied to Dartmoor National Park Authority for approval of permanent residence in the woodland, which they own. The unelected Authority refused in 2015, and issued an enforcement notice. The community appealed, and the inspector, Paul Freer, has dismissed that appeal. His report reveals a misinformed logic, a shallow understanding of landscape, and an attitude of mind that should have no place in the modern world, and certainly not within a national park. He considers both the existing and proposed development unacceptably harms, or would harm, ‘the character and appearance of Dartmoor National Park’ and ‘the purposes of National Park designation’. Mr Freer considers the lack of a continuous tree canopy ‘erodes the character of the woodland’; permanent occupation would cause ‘irreversible erosion of the canopy cover’, despite ‘minimal’ visual impact. Yet, for centuries, the deciduous woodlands of Dartmoor were full of human activity – by charcoal burners, bark strippers (for tanning), moss gatherers, miners, and others, whose clearings were an integral part of Dartmoor’s ancient story of woodland management. The 32 acres of Steward Community Woodland once included a farmstead – Stewardwood – and comprise numerous ancient enclosures. Field names reveal varied historic land-use: coppicing, orchards, a pond, a barn, even a possible mill, besides woodland. The inspector’s report is perhaps most flawed in respect of cultural heritage. Since the Environment Act of 1995 all national parks have a primary purpose to conserve and enhance ‘natural beauty, wildlife and cultural heritage’. Mr Freer mentions ‘natural beauty’, but omits any discussion of historic or contemporary cultural heritage. Yet, in 16 years the woodland residents have added an important and cultural distinctiveness to the Wray valley. The inspector considers the adjoining sewage works, rifle range and the A382 to be less damaging than the ‘residential enclave’ in the woodland, which he says is ‘urbanising’, ‘not well integrated into the landscape’, and not of ‘high quality design’. Although he agrees that the community ‘does broadly achieve its stated aims ’, with ‘81% of requirements met from the land’, he argues that this level of self-sufficiency could not be maintained or controlled by planning conditions. He acknowledges considerable local support but patronisingly dismisses it by balancing it against the ‘national resource’ of a national park and the ‘understanding and enjoyment of its special qualities’ – as if local people have no appreciation of this, nor play any part in it. Mr Freer blithely states that he has been provided with no evidence to indicate that it would not be possible for residents to find accommodation in the local area within a year. He does admit that their rights under the European Convention of Human Rights and the Human Rights Act 1998 would be interfered with, but considers that to be justified on account of the more important ‘opportunities for others to enjoy and understand the special qualities of the national park’. A national park that cannot accommodate and celebrate the community woodland clearly needs reform. The residents’ lifestyle is unusual, but is refreshing and stimulating. They have demonstrated a remarkable commitment, through winter rains and storms, to a way of life very different from most of us. They are deeply integrated with the very supportive local community. Their gentle impact on the land, philosophy and brave experiment should be celebrated, and presented as a leading example of how some of us might live in the future, supported by an innovative and flexible park authority which, since July 2013, has even introduced a policy for ‘low impact residential development in the open countryside’ . The park was created in 1951 when the world population was one-third of what it is now and that of England was only 41.2 million compared to its current 54.5 million. Roger Deakin, who knew Dartmoor, wrote in Wildwood of a woodland community, that it was ‘a practical demonstration that there is another way to live, on terms of greater intimacy with the woods and land – slower, more deliberate and benign: a quiet assertion of greenwood values.’ The dismissal of their appeal is a denial of what Dartmoor could and should be, at a time of environmental concern. Tom Greeves is chairman of the Dartmoor Society, cultural environmentalist and, as President of the Devonshire Association 2015-2016, author of Dartmoor & the Displacement of Culture: Analysis and Remedy.